There’s a new high-speed 3D printer on the horizon which, coupled with the IoT, could really revolutionize product design and manufacturing. 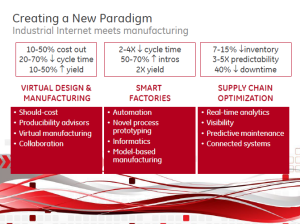 Combined with the IoT, that would go a long way toward making my “precision manufacturing” vision a reality, with benefits including less waste, streamlined products (a single part replacing multiple ones that previously had to be combined into the final configuration), factories that are less reliant on outside parts and encouraging mass customization of products that would delight customers. “Jabil Circuit Inc. [itself a digital supply-chain innovator] plans to be an early adopter of HP’s device, printing end plastic parts for aerospace, auto and industrial applications that it currently makes using processes such as injection molding, John Dulchinos, vice president of digital manufacturing at the electronics-manufacturing service provider, said in an interview. 3D Systems is also making the transition to large-scale 3D printing. As I’ve written before in regard to GE’s leadership in the field, toss in some nanotech on the side, and you’ve really got something. 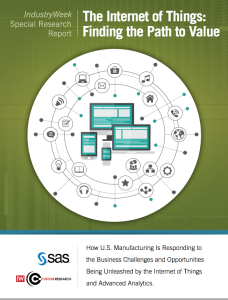 A new Industry Week survey shows that most manufacturers are, at best, just testing the IoT waters, and few have made the management changes necessary that show they understand the IoT’s revolutionary potential to change every aspect of their products, manufacturing, and even their management. On the other hand, 28% said they think they’re outpacing their competitors in use of the IoT. Pardon my skepticism..
On the positive side, 45% are integrating and supplementing IoT data regarding product quality, and 43% integrating production data. I’m up first this morning, & hope to lift attendees’ vision of what can be achieved with the Internet of Things: sure, cool devices and greater efficiency are great, but there’s so much more: how about total transformation of businesses and the economy, to make them more creative, precise, and even environmentally sustainable? I’ve just revised my 4 IoT Essential Truths, the heart of my presentation, bumping make privacy and security the highest priority from number 4 to number 1 because of the factors I cited last week. I’ll draw on my background in crisis management to explain to the engineers in attendance, who I’ve found have a problem with accepting fear because it isn’t fact-based, how losing public trust could kill the IoT Golden Goose. Rethink Products so they will contain sensors to feed back data about the products’ real-time status, and/or can now be marketed not as products that are simply sold, but services that both provide additional benefits to customers while also creating new revenue streams for the manufacturer. I’ll stress that these aren’t just truisms, but really difficult paradigm shifts to accomplish. They’re worth it, however, because making these changes a reality will allow us to leave behind old hierarchical and linear organizational structures that made sense in an age of limited and hard-t0-share data. Instead, we can follow the lead of W.L. Gore and its cyclical “lattice management,” in which — for the first time — everyone can get the real-time data they need to do their jobs better and make better decisions. Equally important, everyone can share this data in real time, breaking down information silos and encouraging collaboration, both within a company and with its supply chain and distribution network — and even with customers. Back with Michael Lynch of SAP! we can change the world and enhance our understanding greater than ever. can help us solve global warming. great case study on heavy truck predictive maintenance in GoldCorp Canadian gold mines. Critical question: who are you in a connected future? Can lead to re-imaginging your corporate role. UnderArmour is now embedding monitors into clothing. Tennant makes cleaning equipment. Big problem with lost machines, now can find them quickly. Asset Intelligence Network — Facebook for heavy equipment — SAP will launch soon. example of a tractor company that’s moving to a “solutions-based enterprise.” What is the smallest increment of what you do that you could charge customer. Like the turbine companies charging for thrust. they have an amazing next-gen. digital platform. More data flow through there than Alibaba & Amazon! CenterPoint Energy — correlating all sorts of data such as smart meter & weather. Better forecasting. Doing a new home-based diabetes monitoring system with Roche. Doing a lot of predictive maintenance. Ending the day with my presentation on first steps for companies to take in beginning an IoT strategy, with special emphasis on applying analytical tools such as HANA to your current operations, and building “precision operations” by giving everyone who needs it real-time data to improve their job performance and decision-making. Much of the presentation will focus on GE, with its “Brilliant Factories” initiative! What if you’re interested in the Internet of Things, but are a little scared of making a major commitment and making major expenditures until you build your familiarity level and start to enjoy some tangible results? That concern is understandable, especially when prognosticators such as I emphasize what a transformational impact the IoT will have on every aspect of your operations and strategy. I’ll speak on this issue at SAP’s IoT 2016 Conference, Feb. 16-19, in Las Vegas, and hope you can attend. But, if not, or if a teaser might convince you to make the plunge, here’s a summary of my major points, which I hope will motivate you to act sooner, rather than later! 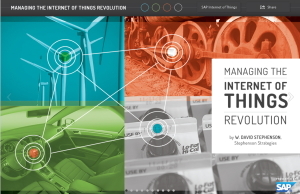 This is an issue that I first visited with my “Managing the Internet of Things Revolution” e-guide to IoT strategy for C-level executives, which I wrote in 2014 for SAP, and which has been successful enough that they’ve translated it into eight languages. invest now in analytical tools (such as SAP’s HANA! ), so that you can make sense of the rapidly-expanding amount of data (especially unstructured data) that you are already collecting, with new benefits including predictive analytics that allow you to better predict the future. even before capital equipment is redesigned to incorporate sensors that will yield 24/7 real-time data on their operations and status, consider add-on sensors where available, so you can take the guesswork out of operations. where possible, process sensor data “at the edge,” so that only the relevant data will be conveyed to your processing hub, reducing storage and central processing demands. develop or contract for cloud storage, to handle vastly increased data. Remember: that’s not exploiting the full potential of the IoT, but simply using it to boost operating efficiency. I see this as bringing about an era of “Precision Manufacturing,” because everyone who needs real-time data about the assembly line and production machinery will be able to share it instantly — including not only all departments within your company but also your supply chain and your distribution network. 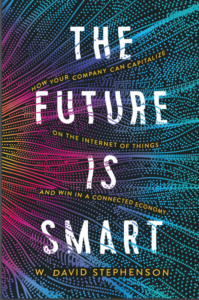 I’ll conclude by mentioning a couple of the long-term components of an IoT strategy, such as redesigning products so that they can be controlled by apps and/or feedback constant information on their status, and considering whether to market products instead as services, where the customer only pays for the products when they’re actually being used, and creating optional data services that customers may choose to buy because they’ll allow the customer to optimize operating efficiency. But the latter are the long-term challenges and benefits. For now, I’ll tell the audience that the important thing is to begin now investing in the analytical tools and sensors that will help them boost efficiency. Oh yeah. Why get started on your IoT strategy now, rather than wait a few more years? Last year, former Cisco Chairman John Chambers said that 40% of the companies attending a recent seminar wouldn’t survive in a “meaningful way” within 10 years if they don’t begin now to embrace the IoT. Sobering, huh?